Media: Soft, glossy, colour covers; A4 portrait format, printed in black and white on 84 good quality, semi-gloss pages. Includes 4 pages of colour artwork and many black and white photographs. Advantages: Another excellent examination, of an often underrated Fleet Air Arm aircraft, by the people who flew and maintained them. Good range of photographs, with most not seen by this reviewer before. Written by someone who actually flew Supermarine's final aircraft design. Following hot on the heels (or should that be the rudder?) of the first book in this series, on the Wyvern, 'From the Cockpit No.2' covers the Supermarine Scimitar. As with its forbear the Swift, the Scimitar was a classic British compromise. Originally designed for one role (in this case, high altitude interception), it ultimately excelled in another (ground/surface attack). Often underrated, and with a relatively short operational career, the Scimitar nevertheless provided a formidable weapons platform in its adopted roles, bridging the technological gap between the era of the Hawker Sea Hawk and that of the Blackburn Buccaneer, which eventually superseded the Scimitar on Royal Naval carrier operations. 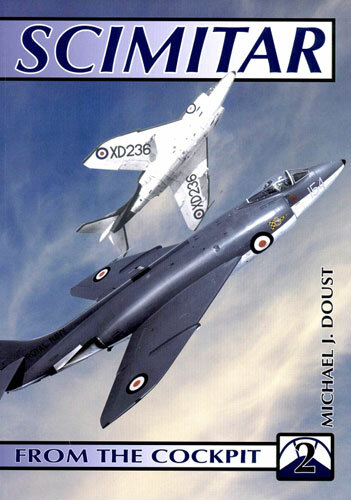 Having authored the first in this new series, and mirroring his own career progress as a Royal Navy pilot, Michael J Doust returns for this second outing, having himself moved onto Scimitars as they came into service. As before, this gives him an ideal perspective from which to comment on the aircraft's performance, handling and operational history. The format of the book follows the now established layout, with his text being printed in two-columns-per-page format, interspersed with photographs, either as inserts or forming the frame or background to the text on each page. Whilst these excellent, good quality, images are again only in black and white, their subject matter more than makes up for that. Inevitably, one or two have appeared in print elsewhere, but the majority have not been seen by this reviewer before and provide a suitably rounded view of this aircraft in service. To compliment the photographs, there are again also four pages of colour artwork (profiles), including a more extensive two page spread covering the author's own aircraft, as flown from HMS Ark Royal in November 1963. Scattered throughout the rest of the book, and supplementing the main text, are separate accounts written by other pilots and groundcrew of the period. Together, these provide useful alternative viewpoints on various aspects of the Scimitar, in both front and second-line service. Finally, there are also the usual 'box-outs', containing pertinent data on performance, squadron lists, etc. Ad Hoc has again succeeded in producing an excellent and informative title, in what promises to be a very useful series for modeller and aviation historian alike. As with the Wyvern, this book provides a valuable insight into the aircraft as part of an integrated fighting unit, rather than just a piece of machinery. Equally, just as the Wyvern was Westland's last piston-engined design, this book on the Scimitar is also a tribute to what turned out to be Supermarine's last design before that company disappeared into the history books. Although the next title in this series is not mentioned, it seems certain, based on the first two offerings, to be well received whatever the subject. 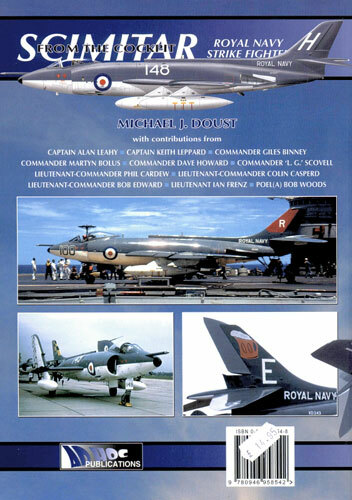 As the author Michael J Doust moved on to the Buccaneer after the Scimitar, maybe that will provide a clue, and if so, there will be much for the Fleet Air Arm enthusiast to look forward to in the future. Review copy courtesy of my wallet (No comment at this time. Wallet).